What a weekend! I feel like I'm ready for a break - this weekend was super busy with a photoshoot at Madame Tussaud's for my client, That! Dairy Snack on Saturday - then rushing home to make dinner - and then rushing out babysit my two favourite little boys on Saturday night before falling into bed at 1am (Jesse tagged along for all of this too!). On Sunday, I was up extra early thanks to daylight savings ending and Jesse and I spent the morning putting together a new set of drawers for our room (as we just didn't have enough room for both of our clothes). We just got the drawers into our wardrobe (after dismantling everything to fit it in) and I had to rush out the door again to another photoshoot - this time a family photoshoot for a lovely family, complete with 3 cavaliers and chickens running around the backyard. With all of this busyness, the last thing I want to do when I get in the door at dinner time is spend half an hour cooking - so freezer friendly recipes definitely come in handy. 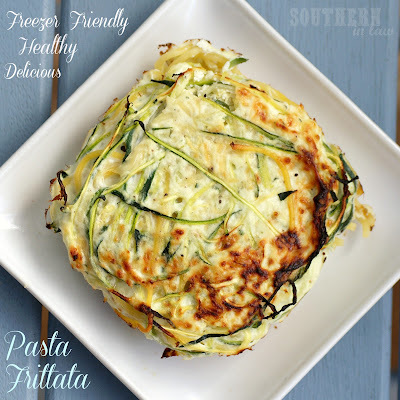 This pasta frittata is one of those freezer friendly recipes which also uses up leftovers and whatever veggies you have laying around - feel free to adapt and change it however you like! In a bowl, combine all ingredients and pour into your baking dish. Place your pasta frittata into the oven until set and golden - about 20 minutes, depending on the size of your dish. To freeze: allow frittata to cool completely before placing into ziplock bags, removing any air and placing into the freezer. 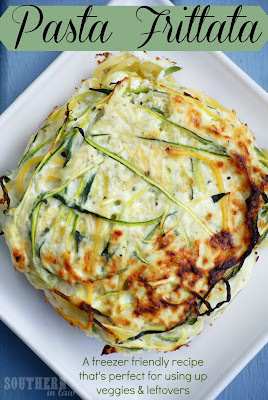 So tell me, what would you put in your frittata?